Do you ever think of making turkey breast? I certainly don't. My usual thoughts are chicken, fish, pork, or red meat, but I never really think to make turkey breast. It's certainly not something I crave - until now! This Turkey Breast with Mexican Squash from the May 2008 issue of Every Day with Rachael Ray was a nice change of pace. I generally only pick recipes that have a side dish with them, mostly because I like to take all the thinking out of it. For some reason, the pressure of deciding what to make as a side dish is too much for me. I know, I have issues. So, when I saw this recipe, with the Mexican Squash on the side, I knew I had to give it a try. 2. In a large skillet, heat 1 tablespoon oil over medium heat. Add the onion and garlic and cook until softened, about 5 minutes. Add the zucchini and the remaining ½ teaspoon salt and cook, stirring occasionally, for 4 minutes. 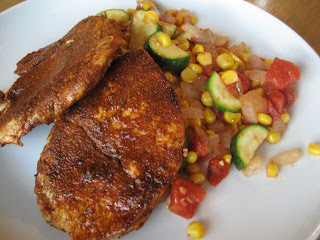 Stir in the corn and tomatoes and simmer until the zucchini is tender, about 4 minutes. Cover to keep warm. 3. In another large skillet, heat the remaining 2 tablespoons oil over medium-low heat. Working in batches, add the turkey cutlets and fry until just cooked through, 2 to 3 minutes on each side. Transfer to a paper-towel-lined plate to drain. Serve with the Mexican squash. Oh, that looks good. I just bought some turkey breasts this past weekend. The Husband was going to grind them up with our new meat grinder and make meatloaf... maybe I'll have him try this! Don't sweat the side dish conundrum... I can't stand having to think about it either. This is why I always end up making the same side dishes over and over and over and over. Mashed Potatoes? Mac & Cheese? Salad? Sauteed squash? You're not alone girl.